Squad 3 stands ready to go at the London Bridge Fire Station in Virginia Beach, Virginia. 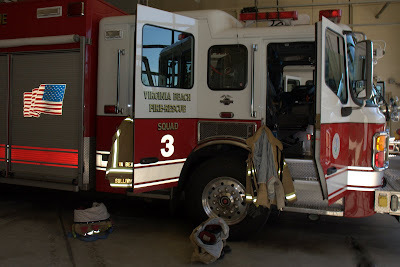 The Squad is VBFD's HazMat team. Canon 40D, f/10.0, 1/40s, ISO 160, Canon 17-55mm f/2.8 IS zoomed to 17mm, with on camera flash.